Important: almonds, as all other nuts and seeds, contain in their skin a special enzyme that inhibits them from sprouting until all the conditions for germination are reached (proper sunlight, moisture). Till that time the almond does not release these enzyme, so by eating it, we also ingest the enzyme inhibitors, that limit nutrient absorption from almonds during the digestion process in our body. The easy solution – soak the almonds in water overnight (at least 8 hours) and rinse them well with fresh water in the morning. Culinary uses: best eaten raw & soaked or lightly toasted. Can be used whole or chopped in cereal, smoothies, salads, baked goods, sauces, you name it. Interesting and useful: as mentioned above take time to soak your almonds (or other nuts & seeds), their nutritional value will increase immensely and they will be easier to digest. If you still feel they are heavy on your stomach, try peeling the skins off after you soak them. 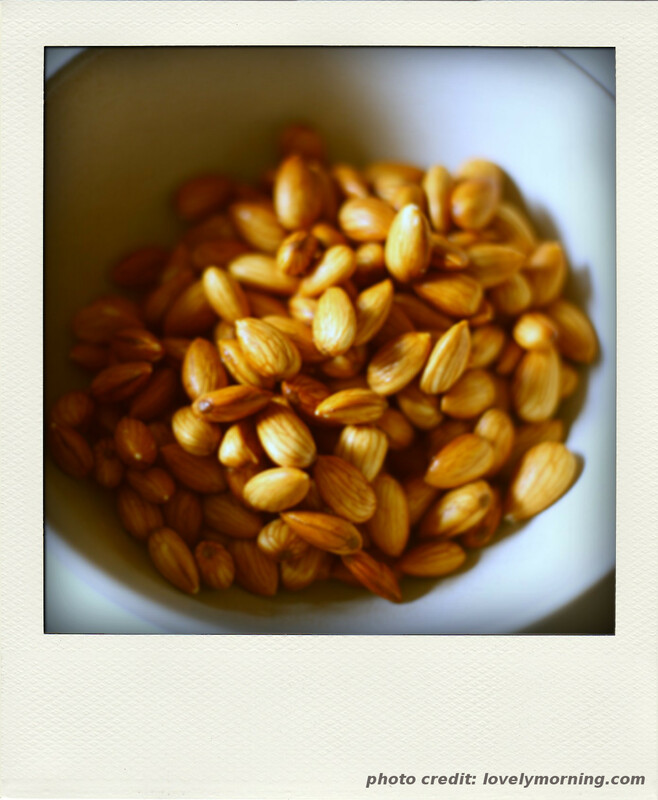 Soak the almonds overnight (at least 8 hours) and rinse them well with fresh water in the morning. Place them in a blender with 4 cups fresh water and blend well. Strain the blended almonds with a nut milk bag or cheesecloth, a strainer or pantyhose, pour the milk in a glass bottle. It keeps in the fridge for 3-4 days. Enjoy the yumminess (is that a word? :D)! You can use the remaining strained almonds on a salad, cereal, in a smoothie or to make a spread. So, remember to soak your nuts to increase their nutritional value and drink some healthy homemade almond milk. It is ridiculously easy & fast and you can try it with other nuts or seeds too. You got to love nature! p.s. : Just a reminder – the words in blue contain a link to the Glossary, where you can check the meaning of some terms used in the post. This entry was posted in Nutrition & Recipes and tagged almonds, Ayurveda, Essential Fatty Acids, food, nut milk, recipe. Bookmark the permalink.